OLYMPIA – With only 74 Southern Resident orcas left in Washington waters, House lawmakers passed legislation (HB 1578) reducing threats to the iconic marine mammals by investing in oil spill prevention on March 7th with a 70 to 28 vote. While Washington has been a leader in deterring oil spills – and holds one of the lowest spill rates nationally – gaps remain in maritime safety regulations. Washington is one of the West Coast’s primary ports for international trade shipping, meaning that oil is constantly being transported across Washington waters. The Dept. of Ecology estimates that approximately 20 billion gallons of oil pass through the state annually. Lekanoff spent her pre-legislative career dedicated to protecting natural resources and clean water. The bill reinforces the Oil Spill Prevention Act and Strengthening Oil Transportation Act by requiring tug escorts for small oil tankers and barges traveling across narrow straights within the San Juan Islands. Oil spills could have devastating ramifications for coastal economies and the environment. Additionally, averting spills is a more cost-effective approach than clean-up responses and restoration. A major spill could cost taxpayers around $10.8 billion and impact 165,000 jobs, according to the Dept. of Ecology. HB 1578 and its companion bill SB 5578 have passed both chambers and headed to the Governors desk. 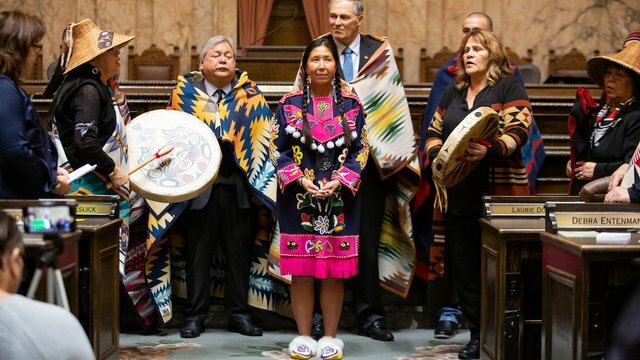 The legislation was introduced by Rep. Debra Lekanoff (Tlingit). This entry was posted in Tribal Leadership, Visionary Leadership and tagged Debra Lekanoff, Inslee, LRInspire, Orca by lrinspire. Bookmark the permalink.